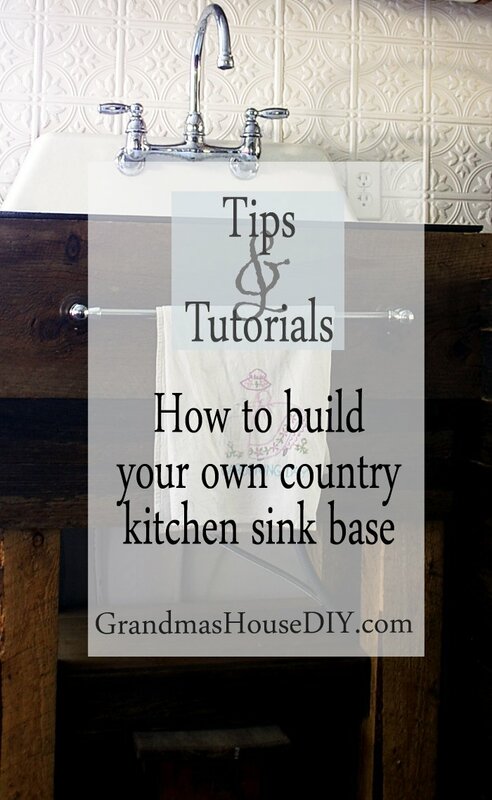 How to: Build your own kitchen sink base! Do it yourself, wood working! I knew from the minute I laid eyes on it that it would become my kitchen sink and that I would be building a custom kitchen sink base for it! Never mind that it had been sitting in a shed for god knows how long and it had, in fact, been filled to the brim with a mouse nest and had probably raised hundreds (if not thousands) of rodents for decades and was, in fact, totally covered in the resulting excretions. Nope, none of that bothered me! I took one look at this sink and my heart soared. It was perfect! NOTE: Minnesota has what is considered some of the harshest and toughest electrical codes in the country. No, that outlet by my sink is NOT a GFCI outlet because GFCI outlets no longer meet code here in MN. Instead, my entire kitchen is on two separate dual GFCI/ACFI 20amp breakers. My materials all came out of the barn or were scraps from the renovation and, amazingly, the drain was in perfect condition – the only thing I had to purchase was the faucet for $70 at my local fleet store. I knew I wanted to wrap the whole outside of the sink with something very big so I headed to my secret stash of amazing barn wood that I’ve been gathering and pulled out the biggest thing I had: a rough-sawn, ancient, 2×10! It was a really basic piece that I had in mind. Four 4×4 legs, 2x4s laid across the top of them for support, and then the entire thing clad with barn wood. First thing I did was get the most accurate measurements of the sink that I could, which was much easier said then done – no part of this sink is flat or square on the bottom side. 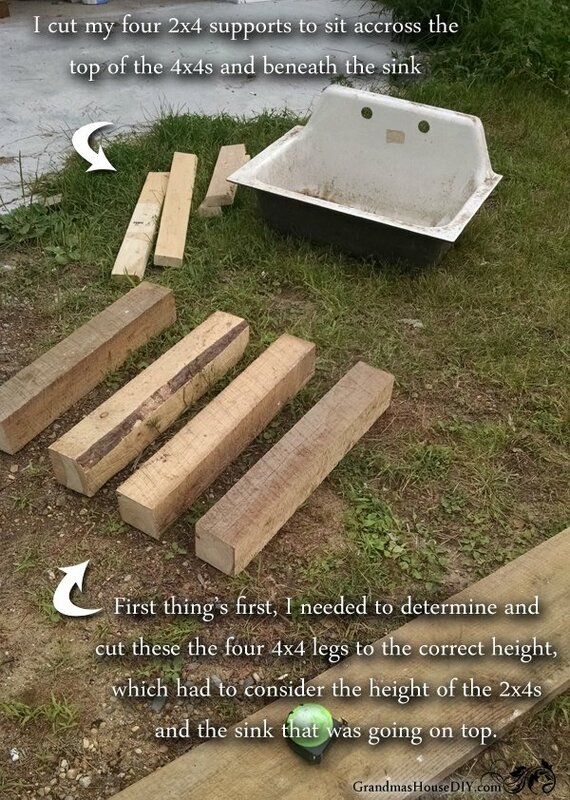 From there, I knew how long each of my 2x4s needed to be cut to fit totally under the bottom of the sink. From there I also knew exactly how tall the 4×4 legs had to be so I got to cutting. I screwed the whole thing together with my impact driver and 3″ screws (that sink is HEAVY – I needed to make this kitchen sink base very sturdy lol). 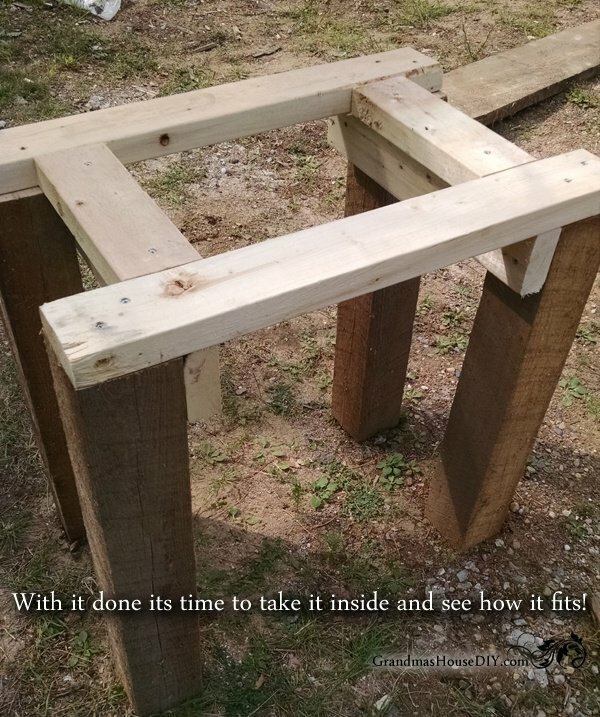 Here the kitchen sink base is complete, I will admit that I had a few doubts but I knew my 2×10 from the barn (as well as some more barn wood to be added) would completely cover the 2x4s but I was still nervous as I hauled it into the house and set it in place. Finally got it in place and the sink and dishwasher all hooked up! 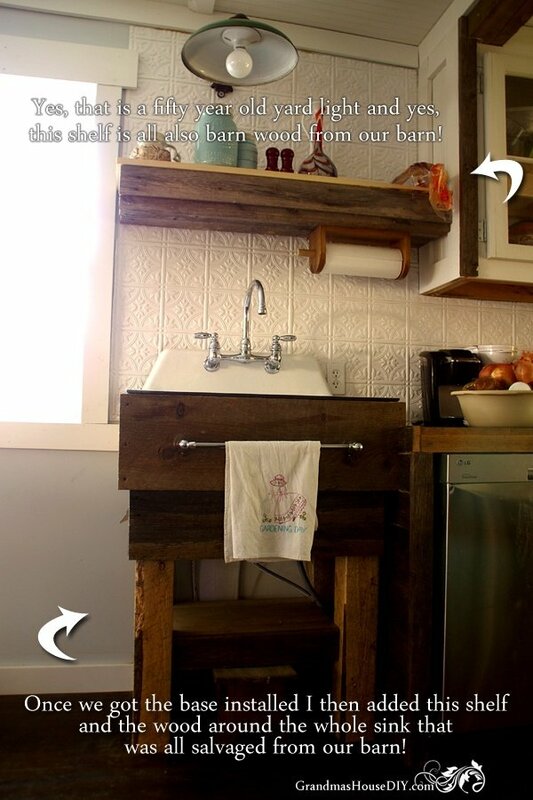 I added a barn wood shelf under the sink as well as one above the sink for extra storage. You can see how the 2×10 hugs all around the sink, I added this after I installed the sink and the base, it looks like its supporting the sink but really its just hanging out, the bottom base I is what is holding the sink up! I added the towel bar after covering ALL of the kitchen sink base and ALL of the barn wood with two coats of poly acrylic. Is that an old yard light above my sink? You’re darned right! It is my grandparents’ fifty year old yard light that hung off the pole of my little farm yard for many decades! It got replaced and when this old light came down I knew exactly where I wanted it to go 🙂 Above my kitchen sink of course! I will put a prettier bulb in it someday, that one was the best one my little fleet store in town offered. The paper towel holder that I added to the bottom of the top barn wood shelf was something my grandparents’ made many years ago. A couple of things I have to admit. The sink is taller then the counter top not because I wanted it to be, actually I planned on building the kitchen sink base so the sink would be about an inch LOWER then my counter top to make for easy wiping. However, when I ran the drain lines in the house I had expected to have vessel sinks in my two main floor bathrooms and, for some reason, my brain read that I needed to have ALL of my drains that high. So it was either rip off the drywall and redo the drain line (over my dead body…) or end up with a kitchen sink about four inches taller then my counter top. So, my kitchen sink is tall and in all actually, I like it a lot 🙂 Because it is high it is MUCH easier on the back for washing dishes etc. I just have to mention, why do they even make sinks that are broken into two parts?! I know, they’re made for when people wash dishes by hand so one sink can be a dish drain rack but, quite frankly, I’ve washed a lot of dishes in this sink and I would never go back to a divided double sink because, for the first time in my life, my sink is big enough to accommodate even my biggest pots and pans! Some updates have happened since this post! Check out the entire kitchen reveal post here AND I added a great little basket to my sink that made my life SO much easier! And here’s just the old cast iron sink so we can all embrace the incredible ickiness that just a little soap, some hot water and elbow grease cleaned up in only a few minutes! PLEASE. tell us what you used to clean that sink and exactly how you did it! I’ve scrubbed tiny spots and can’t get my sink to look even close to this one! Thanks…. and your idea was wonderful. Barbara thank you for commenting! Actually I didn’t mention how I cleaned it because it came clean with just dish soap and hot water and a little elbow grease! I couldn’t believe it, I just used a little soft scrubby sponge. I am so impressed with how creative and clever you are! I would never have thought to rescue that sink by building the base. Bravo! Thanks for joining us for Thursday Favorite things blog hop. Jennifer, thank you for stopping by and for the comment! I was SO relieved when it turned out ok! WOW! I love this project! You have mad skills! It looks authentically farmhouse! Well done! Sharing on FB! Terry thank you so much!! Hello Tarah! Loved your sink so much I’m featuring it this week on Making Broken Beautiful! Have a great day! Wow! Love the sink. Such a good idea to put the towel bar on front. Girl, we’ve got a lot in common I think! 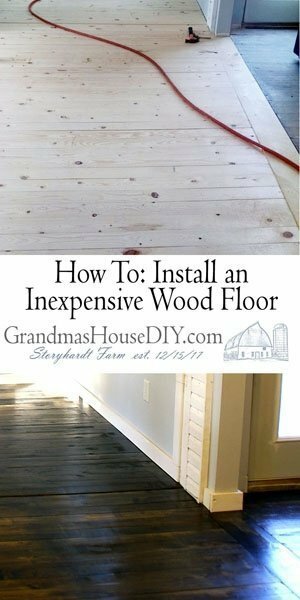 I always drag wood out of my barn for projects too! And I think we have the same backsplash. 🙂 Not sure I have your handy skills, though! Great job building the base! Hey girl! Thank you for commenting! Isn’t it neat to have a barn and such a amazing materials to work with!? WOW WOW WOW!!! 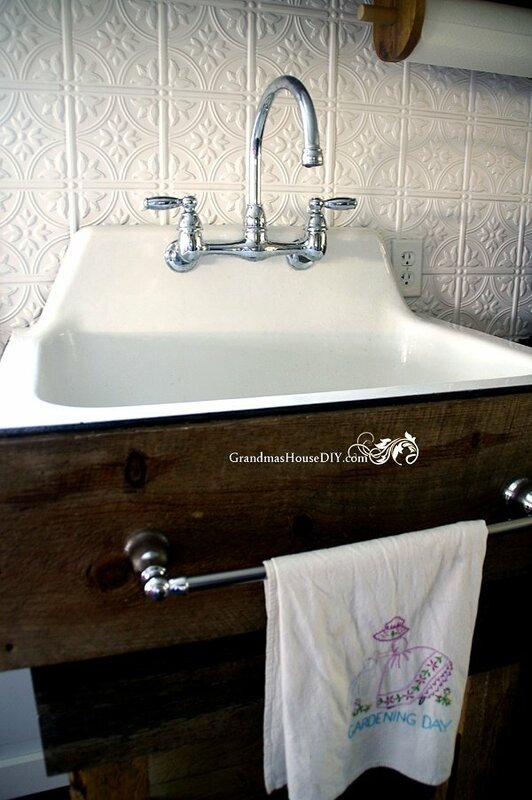 I just LOVE this – such a great use of an old solid sink! You did a fab job building the base and I actually love that it’s a bit taller than your counters, my hubby and I like things a bit taller – way to work it on this DIY! I’ll be featuring your sink base at this week’s Friday Favorites – swing by and say hi!! Dawn, thank you so so much!!! I’ll definitely swing by! I LOVE this! This is just the kind of sink I want for outdoors for arranging flowers and doing other gardening chores. Sadly I don’t have one of these sitting in a barn out back! Your sink and the base are fantastic, and I am so impressed it was all out of “found” pieces! Chloe thank you! What a wonderful idea for one of these old sinks! 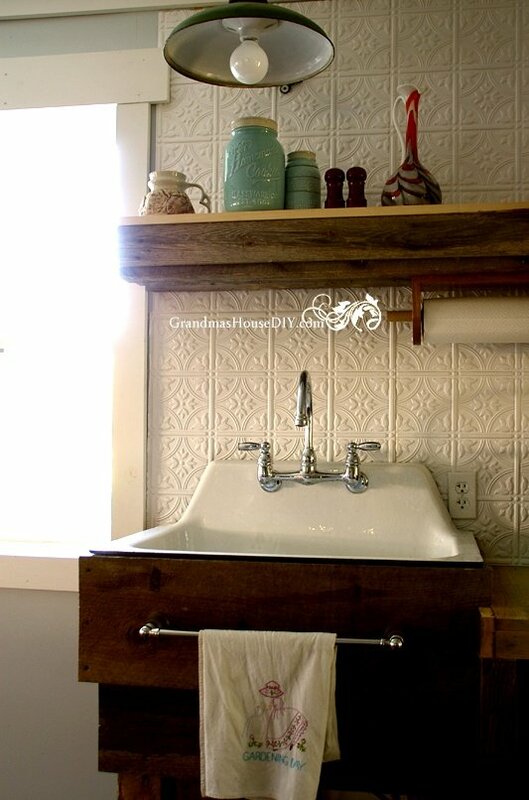 I’ve seen some pinterest images of potting benches incorporating old cast iron sinks and have literally drooled lol Great idea and hope you find one! I’d like to feature this post today at Tuesdays with a Twist! This is gorgeous!!! Thanks for sharing at Meet Up Mondays! Oh my gosh, thank you so much Lisa!! This is incredible! Just whatever you did to clean the sink totally transformed it before you even create the base, which was amazing it it’s own right. I just love the care and time you are taking to make these things new and usable again. I so love to see the progression of these items. Thank you for sharing. Thank you!! Honestly all I used was vinegar and dish soap and a lot of elbow grease! I was shocked when it came clean so easily! You make it look so easy! Most people would not have the imagination to turn this into a beautiful piece of kitchen furniture. Thanks for sharing with us at #OvertheMoon. Oh my gosh Christine! Thank you SO much! If you do build that sink base let me know, I would love to see it!!! 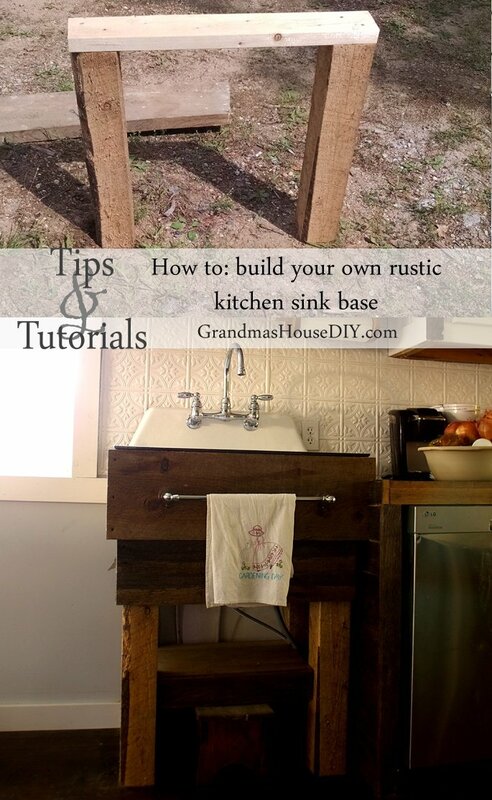 I love the rustic look to this – and the instructions are great! Thanks for sharing on the Pleasures of the NW DIY party! Helen thank you so much! Amazing. Simply amazing. Like a brand new model. The work you did. So impressed. Pinning for sure. I love the towel rack! Great job! Thanks for sharing this at Celebrate Your Story and you should have a Home Improvement Show! This turned out absolutely amazing!! Thanks for sharing on My 2 Favorite Things on Thursday!! Pinned! Wow!! This turned out beautiful!! I’m a novice DIYer, who hasn’t tackled anything like this…but you’ve just inspired me! Stopping by from “Kimberly’s Weekend Traffic Jam” linkup. Have a wonderful weekend! Oh barn wood in bathrooms can be SO pretty! Thanks for coming by!! Wow, this is really impressive. I love this! Thanks so much for sharing this DIY! Super inspiring to look beyond the cosmetics!! Great job with recycling and set up! I have that exact same back splash, looks great too! I think another reason for 2 part sinks is to have things like raw meat dishes/utensils separated from fruits/veggies, etc. No cross contamination. Nancy that makes a lot of sense, thanks for coming by! I learned from my Grandma to “waste not, want not.” I have an old cast iron sink a neighbor threw out after her kitchen remodel. I’m going to use your great idea as a basis for my “new” vanity! Beautiful use of what you had to repurpose your grandparents house. I can feel the love!! Thank you so much Nancy! Yes, my grandma was the same type of gal 🙂 She definitely taught me that if we could build it or make it ourselves it would be silly to buy it new! How awesome. I’ve always wanted to re do a really old house or farm house. Thanks for sharing at the #InspirationSpotlight Party. Pinned & shared. See you again soon. This looks wonderful! 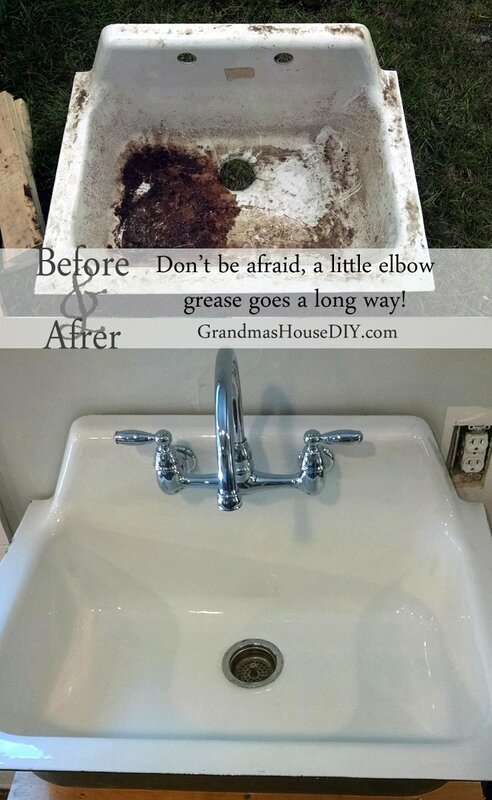 How great that you were able to use the old sink. I love the look. Thanks for sharing at Snickerdoodle! Pinning. Thanks for sharing on Let’s Get Real Link Up. That is amazing sink – I would love that in my house! Wow…this turned out so great! I love those old sinks. I found you on a link up. You should bottle that elbow grease it did an awesome job cleaning the sink. I so enjoyed reading this post. I just think that is because you are so practical, I have no interest in doing anything like this, years ago I would have, but not now. Keep up the good work, your grandparents would be so proud of you. What an awesome job! I’m sure your grandparents would be so proud of your accomplishment. Thank you for sharing with us. Thank you so much Jes!!! Hey Marsha, thank you!! In MN we have some of the strictest electrical codes in the county and GFCI outlets no longer cut it for us! So, instead of a GFCI outlet instead I installed a dual GFCI/AFCI breaker on the whole circuit 🙂 I didn’t mind so much, though the breaker was VERY expensive, I’ve always found the GFCI outlets to be kind of annoying and have had several quit working on me in the past, so it worked out! Its looking so stylish and really a lovable kitchen sink ever. Its a another part that adding a bar with this. White color is beautiful but I’ve a little confusion about it. Does a white sink dirt quickly? Thank you for sharing this. 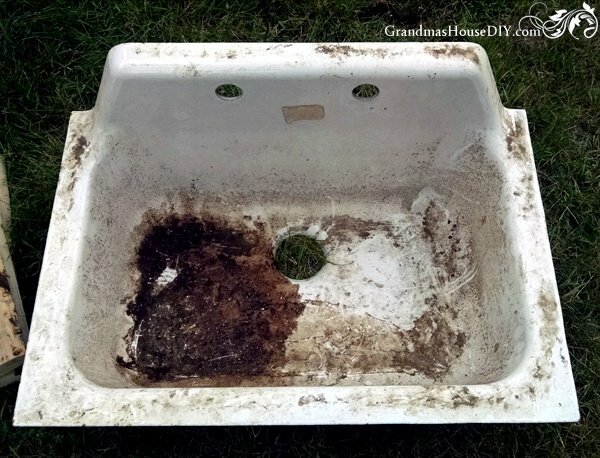 Hi Sheila, because this sink is so old it does have scratches in the bottom of it and those are the only places it gets dirty and needs scrubbing otherwise these cast iron sinks don’t stain at all and are as tough as nails! Love your sink and your ideas! Have not talent of my own but enjoy seeing others. Please tell me that you have replaced the outlet on the right hand side of the new sink with a ground fault outlet. A regular outlet is not safe that close to a water source. We learned this the hard way and now have the ground fault at all kitchen and bath sink areas. Good Luck with your remodel. It’s lovely! I love your sink and your base. This wasn’t a kitchen sink, right? Were you able to add a garbage disposal? Hi Michele, we did not add a garbage disposal as we’ve never had one lol and didn’t think we needed one but I think it would have been just as simple to install here as on any other sink. I honestly don’t know what this sink was “built” for – it was so old I really don’t know if it was literally once made to be a kitchen sink or otherwise. Regardless, its SO deep and big I just love it! Hi Tarahlynn! I love, love, love it! Do you happen to o have the dimensions of the base that you made? I assume the sink is really heavy and needed extra support? it is perfect for the sink! Hey Jen, yup this sink weighed a TON – I could barely move it on my own lol With most sinks they sit into the counter top and just hang there by their lip that runs across the outside top of the sink but because of its weight I just didn’t dare try that. 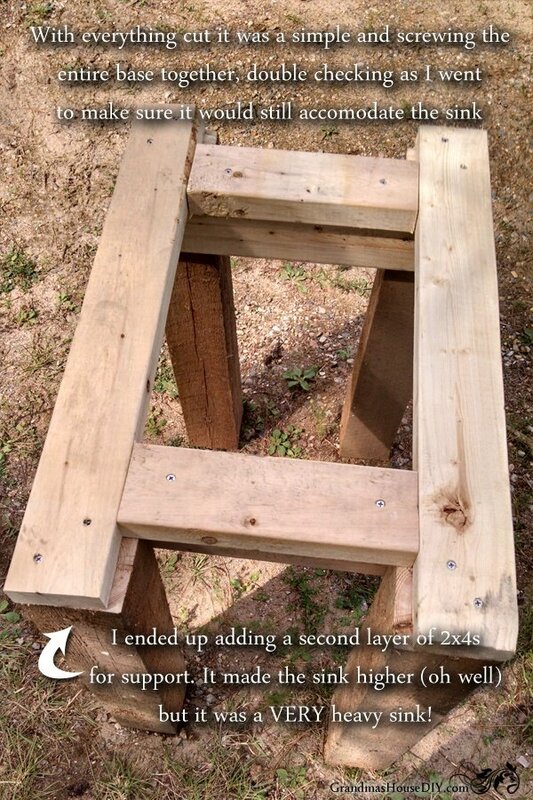 Instead I built the base to the size of the bottom of the sink so it would sit directly on those 4x4s. Sorry I don’t have the dimensions! 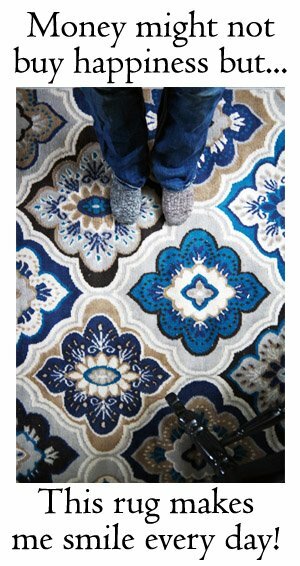 You really are creating the loveliest of homes one project at a time. Everything about your decor is one of a kind vintage. Its beautiful. What a great transformation. It’s amazing the things thst can be salvaged with just a little but of effort. Beautiful! i’ve been struggling for a year trying to figure out how to build a base for my vintage cast iron sink with drainboard. i haven’t been able to find anything suitable or to my taste until now. your base is so simple to make and exactly what i was looking for. a million thanks for sharing this. Oh Lyn that’s so great to hear! I was so excited when this turned out because it’s impossible to find cabinets that work with these old beauties and custom sink bases are incredibly expensive! Love your work. I’m trying to design something similar for my house in Australia so this is very helpful. My question is, where do you drain your pots etc? Hi Diana, we have hooked up to a regular sink drain and it goes into our septic tank – thanks! Giggle. I noticed the outlet and did think about it not looking GFCI. 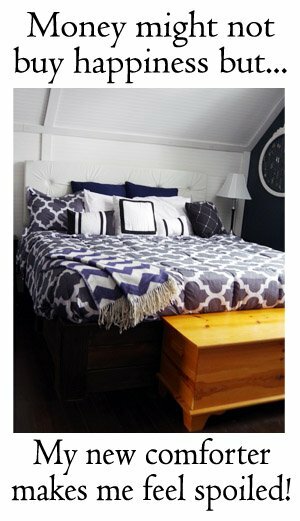 I love the barnwood pieces. The rustic weathered look is perfect. Thanks for sharing on Friday Frivolity. Thanks for the information about kitchen sinks and counter tops. I have been wanting to get new counter tops in my kitchen for a while now, but I don’t know what would look good with my sink and appliances which is why I am really glad I came across this article. Great, thanks for coming by! Oh wow – this is seriously impressive stuff 🙂 I love upcycling things, but since having children I struggle to find the time! Wow, what a transformation. It turned out great! Thank you for joining The Really Crafty Link Party. Pinned! Thank you Terese, have a great weekend! WOW! I mean, WOW! That is not only a great upcycle project but dang is it BEAUTIFUL!! You are SO talented! Thank you SO much Mrs. K! Have a great weekend! Thank you for coming by Carrie! Have a great week! Thanks for the sink idea! we have been looking for something similar to place our metal kitchen sink.